The Chain is a group of at least three islands in the Eltheric Ocean, south of Hegathe in Hammerfell and west of Stros M'Kai. The two smaller islands trail off to the west. 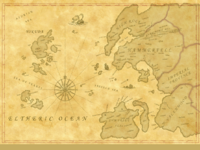 By the late Third Era, the islands appeared to be considered part of Hammerfell in certain maps. This page was last modified on 28 November 2018, at 07:01.